Okay I saw the TV box now, yeah it's SeeSee. And the car they arrive in on the ferry is a Lincoln MKT. Says right on it, logo and all. Yeah you're right, I checked after. I couldn't tell what it was named though but it wasn't a real brand. The Tv in his apartment was one of the few things that was fake branded. seesee tv. The Ford car at the trailer park. The Pennzoil and Castrol brands or w/e in the garage at the Junkyard in Episode 6 I believe. Verizon obviously. Energizer batteries everywhere. Anything else? Other vehicle types that were a blatant reference? (meaning it was stamped with a logo). OH the Sync brand name on the dashboard of one of the cars, I think it was in a cutscene. What about the computer in Alan's apartment? Windows? Or his new unpacked TV. What brand was on that box? 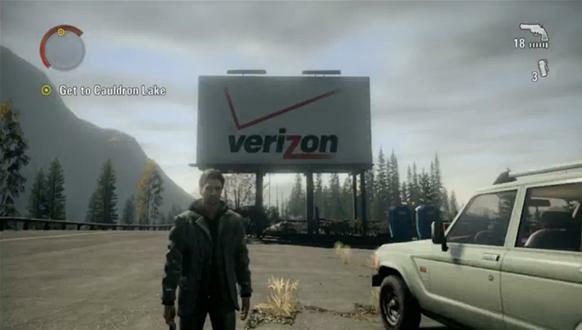 I'm sorry, but since when has Verizon put a massive advertisement in a middle of nowhere? That annoyed you? I guess I just didn't really notice the first time. Although I'll admit, in the Signal when Alan gets his cell-phone by popping one of the light-wordy thingies, and the camera stops just in time in midair to catch the Verizon symbol on it, I had to roll my eyes. I haven't ever noticed these things. I'm also unfamiliar with the brand names, so for all I know, they're fake. If not for this topic, I probably would never notice. True but its not a case of the ad just poping up is it. You have to click on the tv for it to appear and as i said most would have probably missed it. Many would have probably missed it and with the achievements name im guessing it was put in that part of the game as a little joke. Joke or not, it definitely did not fit in the situation. Well, perhaps that is part of the reason. Still imagine the train scene of Uncharted 2 with a sudden tv ad popping at the screen. I would love a game that took the mickey out of in-game advertising. The whole game would be like a giant advertisement, and the protag would be constantly annoyed by it. kind of funny for me at least. maybe only a level. i really like the xbox in the hospital. pretty cool; not really advertising, considering you'd kind of already own an xbox to be playing the game. but yeah, i don't get why people are that ticked off by the ads. for a game that was in development for 5 years, it needed funding; you weren't watching ads in every loading screen or every second of the game. the most prevalent logos are on the batteries, which makes sense. then again, that's just me. "Let the chips fall as they may." Wow some people seem to over react. It never got in the way of the game which is fine by me. But thats an ad that can only be seen if you click on the tv. Many would have probably missed it and with the achievements name im guessing it was put in that part of the game as a little joke. Same with the 360 in the room its just a little fun. Like in Shenmue when Ryo could not only pull out a Saturn but PLAY it! This never annoyed me at all. I actually thought it was kinda realistic, well, now I do. All times are GMT. This page was generated at 03:42 PM.